The pay gap has closed by less than a nickel since 2001, according to the report by the American Association of University Women. At this rate, gender equality is many years away. The pay gap between women and men in the U.S. isn’t closing as fast as it used to, and it could be almost another century before it’s eliminated, according to a new report. Washington state ranks in the bottom half of states in pay equality. Women on average made 80 cents for every dollar their male counterparts made in 2017, according to a study by the American Association of University Women released Tuesday. Women in Washington made 78 cents per dollar of men’s earnings, ranking our state 35th. California and Washington, D.C., topped the list at 89 cents per dollar, while Louisiana came in last at 69 cents. In a year that has seen the rise of women’s rights to the forefront of political discourse ahead of contentious midterm elections, the report highlights just how little progress has been made in closing the gender-based income gap since the turn of the century. Cultural and workplace norms have hindered efforts to close the pay gap, which narrowed by less than a nickel since 2001. That’s especially true in the private sector, where, unlike government jobs, compensation isn’t made public and some employees are discouraged from, or even punished for, disclosing it to their colleagues, the report said. 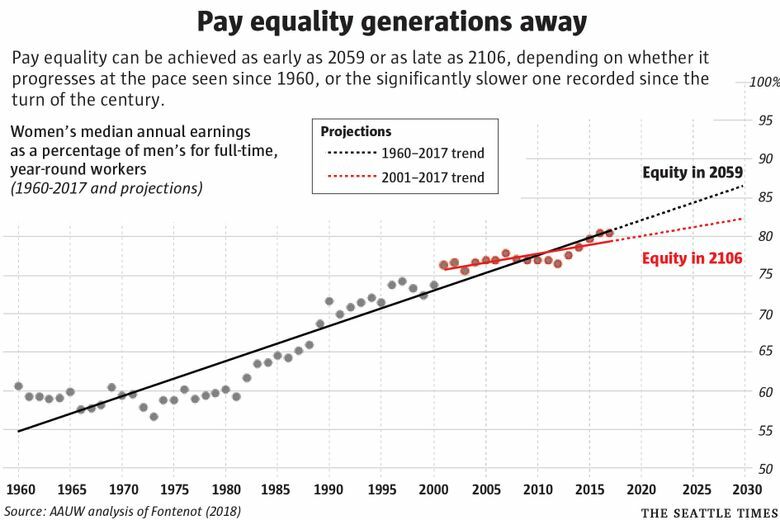 Pay equality can be achieved as early as 2059 or as late as 2106, depending on whether it progresses at the pace seen since 1960, or the significantly slower one recorded since the turn of the century, it added. Rep. Tana Senn, D-Mercer Island, the prime sponsor of the recently passed HB 1506, which broadened and updated Washington’s equal-pay laws for the first time in 75 years, said she had a hunch the growing gap between low- and high-wage earners in this century has impacted women disproportionately. In her view, this could explain why the rate at which women’s salaries gained ground has slowed down in the past two decades. From 1980 to 2000, women’s wages compared to men’s jumped from 60 cents to 75 cents, but that trend did not continue as the millennium progressed. The law was ahead of the game, taking on many of the suggestions the report recommends. It allows employees to talk about their wages without fear of retaliation, and forces employers to provide equal opportunity for both genders in career advancement, but it doesn’t outright ban the use of salary history to determine an employee’s worth. “That’s the next step,” Senn said. The report recommends that women should negotiate their salaries, like their male counterparts, by emphasizing to their employers the value of their skills, discussing common goals and maintaining a positive attitude. Employers, meanwhile, should recognize that “equal pay is important for legal and ethical reasons, but it can also be good for employers’ bottom lines and employee recruitment and retention,” the report said. Studies have shown that workers who believe they’re being treated fairly have higher morale and are more productive, it said. Employers should also allow employees to disclose and discuss their salaries with their coworkers without retaliation, conduct audits on their pay practices, and end the common practice of using a worker’s previous salary to determine his or her new one, according to the report. Other recommendations include implementing laws to guarantee pay equality. In Washington, it’s illegal to retaliate against employees for discussing their wages, but the law does not require employers to collect annual pay data based on gender. While the report found that women across all racial and ethnic groups experience a gender pay gap, certain women of color, such as Latinas, African Americans, Native Hawaiians and Pacific Islanders, typically made less money than white and Asian women. The report also found that in some cases the pay gap among women of color is widening. The report used data from the U.S Census Bureau, the U.S. Department of Education and the U.S. Bureau of Labor Statistics, to calculate pay gaps nationally. State data was derived from a survey that supplements and is distributed by the U.S. Census.